Best filter ever!!! Been using these filters for 22 yrs. To get an AC in FL to hold up for 21 yrs is unheard of. I attribute it to these filters for keeping the inside handler cleaner that any other. I've got a new AC & I will be using these. Have recommended them to others and they're pleased. Love company's email reminders & discounts!! PLEASE keep making them!! I like the quick turn around service when I order from the Filter Factory. The Biosponge Plus furnace AC filter refill fits exactly so I do not have to cut it. 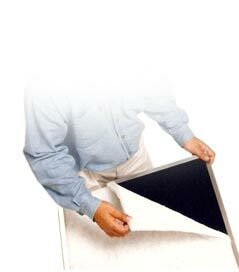 These filter pads are custom made to the exact dimensions you need, so easy to replace. And they only have to be changed every two months. I order 6 at a time and they are delivered in only a few days. I having been using these filters for years. So much better than store items. Worth the price. Does an excellent job. This is the best air filter ever. Because the frame and filter is custom made, it essentially fits perfect preventing gaps that allow unfiltered air through the A/C handler. "Dirty" air going up thru the handler reduces efficiency and allows dirty air up through which eventually clogs the duct work. The filtered pollutants don't go all over the place when filter is changed like regular pleated ones do. I have used these now in 3 different homes in the last 19 years. Service is fantastic and I appreciate the convenience of quick turnarounds, reminders, discounts, and the reward system. Thank you so very much for a quality product. Love this company. Their delivery is fast & dependable and their product is great quality - CONSISTANTLY! I received my first Biosponge Plus filter when I replaced my old central air conditioning system in South Florida in early 1990's. We immediately noticed a big reduction in dust throughout the house. We've used them from that time on. When I purchased a new home in Central Florida, I immediately ordered a new frame and a packet of Biosponge Plus filters on line to fit that system. I do not see us ever using anything else. 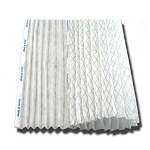 We've been using these filters for 10 years, since we found out the house we moved into had some mold issues (since resolved), and that my husband was getting sick from the mold spores. These filters really do a good job of cleaning the air! So much better than the store bought "cheapy" ones. We'll never go back! Highly recommended! Went to Our Town in the 80's and purchased a pack of filters and i'am still using them , just a great product ! No complaints so far. Customer Service and Delivery excellent also. Glad I found them. Perfect fit - can’t find needed size in local stores. 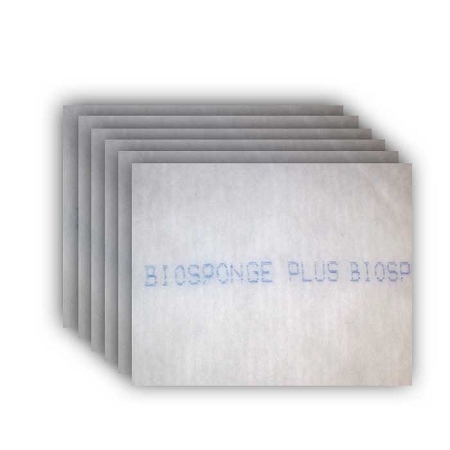 The Biosponge filters do an excellent job of trapping dust and dirt. This is a great product. We have used these filters for many years and never have had an issue. We would recommend you use these filters. Have been doing business with airsponge for several years now. They are always prompt, courteous & reasonably priced. Highly recommended. Have been using this product for several years. Great product, easy to order, easy to install. Love it! The quality of the Bio sponge filters and the customer service are both top notch. I have been a customer for several years and would not consider a different source. We originally ordered replacement AC filters from our AC service contractor which I considered somewhat expensive. I did some research and found the same filters available online a lower price at Filter Factory. The ordering is easy and the delivery is fast. 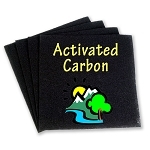 These A/C filters (Biosponge Plus) are easy to use and easy to purchase! Q: What is the difference between Biosponge and Biosponge Plus? A: Biosponge is a 30-60 day filter and Biosponge Plus is a 60 day filter. Biosponge Plus is woven denser so it will last longer and is more efficient at 92.3% Arrestance. Q: What size are these filters? I need 13.75 x 13.75. A: Our filters are custom made to the exact size you require. Q: Does the frame faces up or down? A: The black mesh of the frame should be facing the unit and the writing side of the pad should be facing out to the room. A: The gasket side of the frame faces toward the unit and the filter material should be facing the opposite direction. Q: Whats the difference Biosponge regular and biosponge plus? Q: CAN YOU PLEASE CUT THE REORDER FILTERS ONE HALF INCH SHORTER ON BOTH LENGTH AN WIDTH? Q: I need a custom frame for this filter size also. Can you make it? Q: I need 13.75 wide x 42 inch long and 3/4 to 1 inch thick micropore filter with frame. Can you make this size? Q: I want to 1" thickness. see no choice for this? A: 1" thickness is standard. 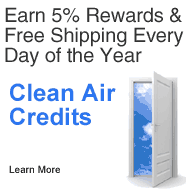 68 Clean Air Credits will be rewarded to you when you buy this item.